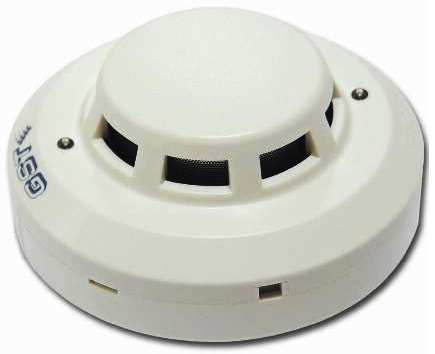 Fire Projects has installed C-9102 Conventional Photoelectric Smoke Detector various sites which is non-addressable. Used together with end of line unit, it can connect with compatible control panels to process detection signals. C-9102 Conventional Photoelectric Smoke Detector supplied by Fire Projects shows fire alarm by LED indicators and transmits the fire signal to the control panel. Using infrared scattering technology, the smoke density can be detected. The detector receives very weak infrared light under normal smokeless condition. If smoke particles enter the chamber, the received light signal will increase by scattering. When smoke density reaches a pre-set level, the detector will alarm out. In order to reduce interference and power consumption, the emitting circuit works in pulse mode to prolong the life of IR LED. Select Fire Projects to design solution of fire alarm system using GST C-9102 conventional photoelectric smoke detector. We support our clients from Designing up to Commissioning up to AMC. We also provide AMC–Annual Maintenance Contracts for all types of Fire & security Systems. Indicators: Red. Quiet in normal condition. Illuminates steadily in alarm. Remote Indicator Output: Directly connecting with LED (built-in 2kΩ resistor in series). Quiet in normal condition. Illuminates steadily in alarm. Wiring Polarized: 2-core for detection zone cable. Polarized 2-core for remote indicator.